Next year on December 1, we will mark the 100th anniversary of the death of Blessed Charles de Foucauld, whose life, witness, and continued intercession are very much needed today. He was rich young man, an agnostic, living a wild and decadent life. The military sent him to Algeria, however, where he was struck with astonishment at the sight of Muslims at prayer. It was the beginning of a longing for God that would take him on a great journey of exploration through Morocco and then, finally, to the rediscovery of his childhood Catholic faith. Faith led to a unique vocation, a desire to follow Jesus in the depths of abandonment and humility, to find the love of Jesus by emptying himself like Jesus: "To be as poor and small as was Jesus. Silently, secretly, obscurely, like Him. Passing unknown on the earth like a traveler in the night, disarmed and silent before injustice, like Him...."
He went to Nazareth, then Syria, and finally into the desert and the mountains of Hogar in southern Algeria, where he lived as a hermit among the Taureg people, placing himself at their service and attending to the needs of their neglected black African slaves. He longed to bring Jesus to these poorest of peoples, and became a witness to love—finding and loving the face of Jesus in every person. He planned a religious order that would witness to the love of God among the poorest and most abandoned peoples of the world, but no one would join him during his lifetime. He remained alone with his people after the war broke out and the French abandoned the desert. 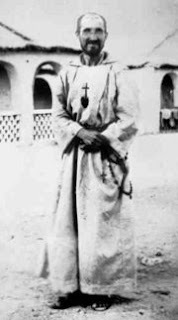 He longed for martyrdom, and was killed by Islamic extremists on December 1, 1916, persevering to the end in faith and love. He died alone, forgotten, and to all appearances a failure. Yet his friends in France remembered him, collected his writings, and eventually helped found communities of contemplative men and women, the Little Brothers and Little Sisters of Jesus. 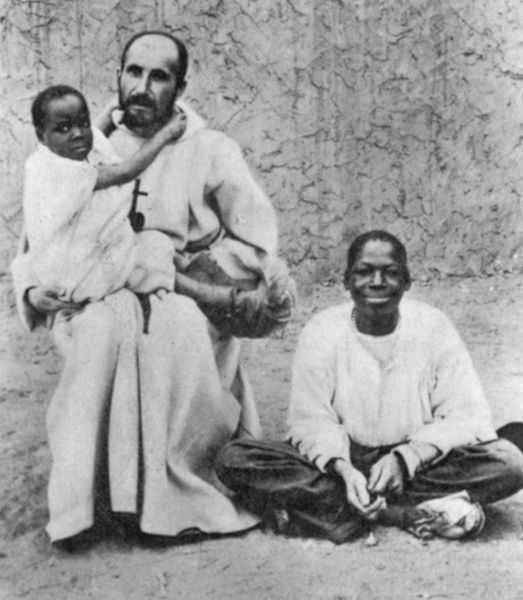 Blessed Charles de Foucauld is sometimes viewed as a pioneer of interreligious dialogue and peaceful coexistence between peoples. This description alone falls short, however, of expressing the heart of his mission and charism. For Charles the heart of dialogue and coexistence is love, and the heart of love is Jesus. Jesus in the Eucharist, in the fullness of His self-emptying gift, and Jesus in every person. I would like to present some reflections on this point by one of Blessed Charles's most famous disciples, a man who lived a very long life in the world, wrote prolifically, sought the love of wisdom as a married layman, and then retired to a hermitage and professed vows as a member of the Little Brothers of Jesus at the age of 90, one year before his death. In the end, the great Jacques Maritain did as much in the service of the contemplative charity of Blessed Charles as he did in his lifelong exposition and development of the philosophy of Saint Thomas Aquinas. Maritain understood that love, first and above all, seeks Christ, serves Christ, humbles itself before Christ present here and now in every person: Christ who identified Himself with "the least of these," and who begs for our love through them. "In one guise or another and in one way or another, all men, at least potentially, are members of Christ, since He came into this world and suffered death for all of them and, since, barring a refusal on their part at the final instant of their life, He has saved all of them." Our calling, therefore, is to "love [non-Christians] first of all in their own unfathomable mystery, for what they are, and as men in regard to whom the first duty of charity is simply love. And so, we love them first and foremost the way they are, and in seeking their own good, toward which, in actual existence, they have to advance within a religious universe and a system of spiritual and cultural values where great errors may abound, but where truths worthy of respect and of love are likewise certainly present. Through these truths, it is possible for the One who made them, for the Truth who is Christ, to touch their hearts in secret, without themselves or anyone in the world being aware of it." Therefore, "apostolic preaching must be rooted in the love of the non-Christian, loved primarily not as a potential convert, but for himself and for what he is" --remembering that "it is not His ministers but Jesus Himself who converts souls by the hidden windings of His grace, so that preaching and teaching come to achieve rather than to start the secret motions awakened in souls by His love and the love of His servants."